The oct series about to end with writing 5200CE nearly 1crore 20 lakh contracts kept open in 5200CE before the Muhurat trading begins. 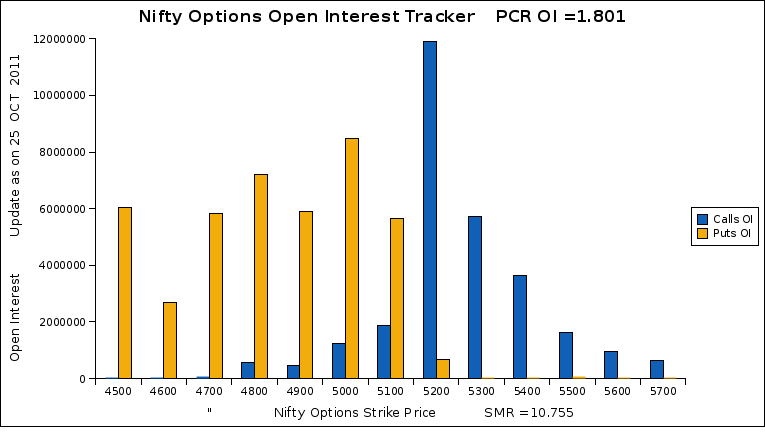 Open Interest OI is at the most bullish zone. Those who are in long postions are requested to be cautious as the shorter term trend could be bearish and reversal can be expected. Happy Deepawli to you and your wife. PS. Look up the 5 minute chart of Oct 2010 series, is what repeated this Oct after 12 months. The NF-Nov is on vast premium to NF-Oct and Oct-spot. It makes meaningful trade to short NF-Nov as the differential would narrow downwards when market opens for new series the next day. But, with festival holidays, better go short by writing ATM Ce. I fathom much of the OI in 5200Ce would subside first hour on open. the spanner of caution this time is world news!! Wishing you and your family a happy and prosperous diwali. If i not wrong, I believe this is your Thalai Deepawali. nsoy maapale! !